I thought that this free form peyote necklace would be a fun one to introduce during this month when we're celebrating gemstones and pearls here at Beading Arts. 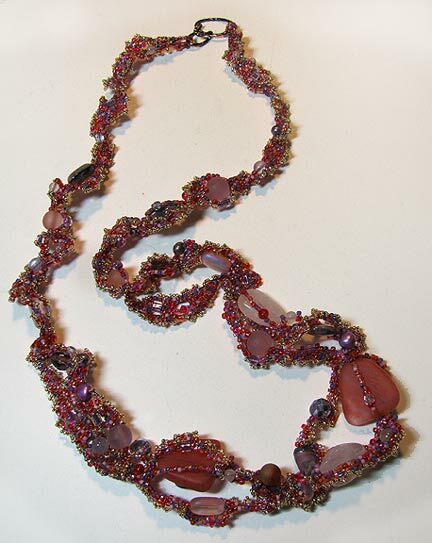 The seed bead work is the perfect frame for your gemstone beads, especially if you mix them up into a sort of "bead soup" like this example. I had a few of these and a few of those, and somehow they all ended up working together well in this piece. As usual, I'm lacking a name for it, but I'm thinking about Caribbean Sunset...what do you think? 1. 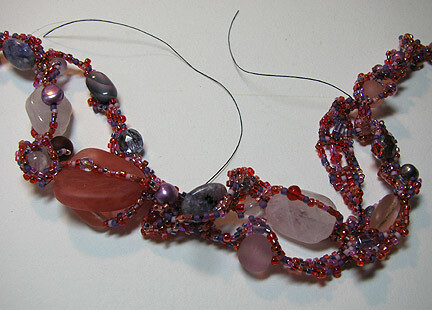 Use mostly size 11/0 seed beads for the base strand. Make a loop of seed beads around one of the hammered ovals and tie a knot. Create your base strand of beads, a bit longer than you want the finished necklace to be, alternating seed beads with an occasional accent bead. 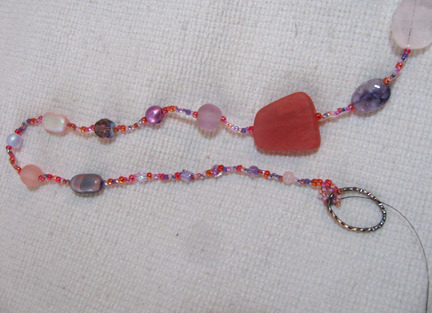 Place the larger accent beads near the middle of the strand. 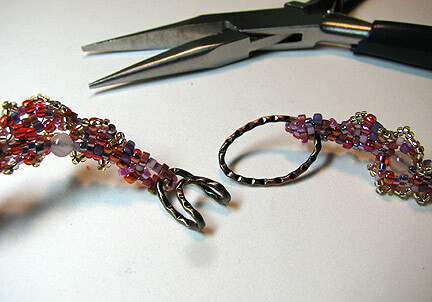 Finish off the other end by making another loop of seed beads around the other oval link and tie a knot. 2. 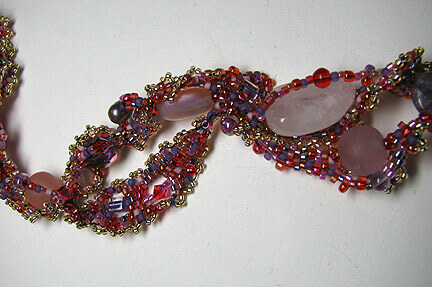 On your second pass, begin peyote stitch with seed beads between each accent bead. 3. 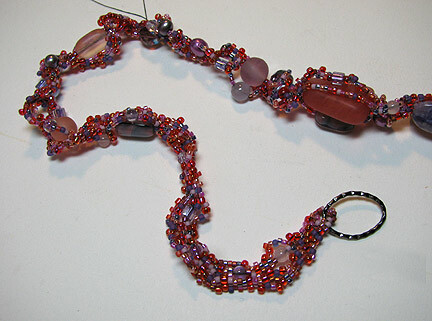 Continue free form peyote back and forth across the necklace, adding more accent beads and forming bridges with seed beads around the larger accent beads. 4. Clean up your thread ends as you go: knot the end a few times around a nearby strand thread and work the end with your needle back and forth through some of the seed beads. Clip the ends flush. 5. When the necklace is just about as full as you want it, add a couple of passes of size 15/0 picots to each edge of the work. I used gold to give the piece more sparkle. 6. Use your chain nose pliers to make one of the ovals narrower. Use the pliers to bend the end over to form a clasp. Awesome Cyndi! I'm not that great at freeform, but you've given me some great ideas? I have a bunch of tumbled gemstones that aren't drilled, how could I incorporate those? Thanks for the inspiration! Cool necklace and the name sounds fitting. Thank you Cyndi for giving some instructions. I've been wanting to do a freeform peyote bracelet (starting out small)but just did not know how to go about it, now I do. I really like the look of this, Cyndi. Beautiful. At first glance, I had no idea how one would even begin to do this! Thanks for the step-by-step photos, Cyndi. I like the name Caribbean Sunset; but the piece also reminds me of a Sedona Landscape. I do like both "sunset " names. However, it really reminds me of wonderful red wines...might just be how my my brain works ... LOL!!! I'd call it "Nouveau Beaujolais"
Beautiful! It does look like a Caribbean Sunset. This is just beautiful. I'm not a big fan of most of the "free form" peyote pieces that I've seen, mostly bracelets - I think I saw one that I liked okay in my LBS a while ago. Allie, I think that sometimes "free form" is understood to mean "design-free", which is a shame! Yes, it takes some planning to do a good free form piece, at least for most of us ;-) I hope you'll try it sometime, because you definitely understand the dangers! Cyndi, this is a great tutorial. I have made a couple freeform bracelets in the past. But the last one I was working on started coming apart where I had added the new length of thread. So I tore it all out and started over. I am now ready to add the next length of thread but, I'm nervous my knot won't stay in again and all my work will be for nothing. Do you have any suggestions on how to keep knots in and hidden in the work. Thank you, Melissa. Hi Melissa, I'm sorry that happened to you :-( I don't usually make knots anymore, although I used to all the time. What I'd suggest, whether you knot the threads or not, is to anchor your thread really well by taking some circular routes through your work, backtracking and reversing directions a few time, to exit near where you want to begin again. 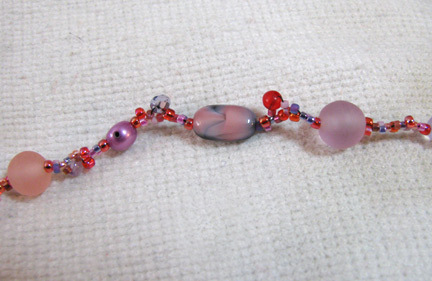 It's really easy to do this with free form, especially if you use beads of different sizes. Add a few knots along the way, and hit each one with a drop of G-S hypotube cement. Thank you so much for your help Cyndi. I'll try that tonight when I get home. I've never glued my knots before, I guess I got lucky..... Hope my other bracelets don't start to fall apart too. Thank you so so much for responding! I hope it works for you Melissa. Just be really careful about the type of glue you use if you do choose to glue the knots. Some types will weaken or dissolve the thread over time. That's why I specified the brand. Cyndi, where can I buy that brand of glue? Does JoAnns carry it or maybe Fire Mountain Gems? Would a dot of clear nail polish be ok? Or would that damage the thread over time too?